No, this is not a pun. I wrote about sandboxes and taking the idea of default goals from megadungeons on monday, and how it finally made sandbox campaigns click for me. And it finally made me understand how I would properly run a Dark Sun campaign. A sandbox is a perfect match for it. One issue with the setting as described is that all the interesting possible oponents are fabulously powerful. If you want to engage in the current public affairs of Athas, you’re facing immortal sorcerer kings with limitless resources and whole armies of seriously dangerous minions. Yet doing regular bandit killing and caravan guarding would be just way too bland for a setting like this. Even being an ordinary adventurer looking for gold in dungeons would be kinda meh. But as a sandbox it all makes so much more sense. 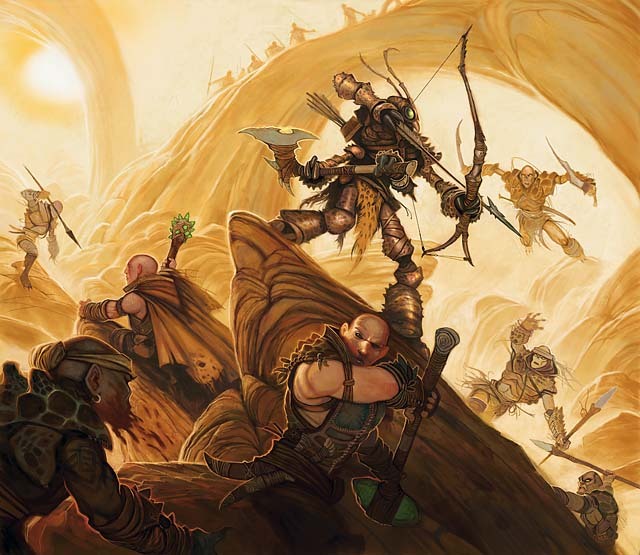 The default action in a Dark Sun campaign is “don’t die”. When you’re in a city, then the templars of the sorcerer-kings are everywhere and looking to kill or enslave you for the slightest reason. If you’re not in a city, then it’s a constant fight to not be killed by the desert. Sitting around idle is never an option, you are always facing a threat. If you don’t have any specific goal for now, then simply staying alive and free will always keep you occupied. It’s a world that really comes to life through random encounters. Random encounters are not the hand GM nuding the players to do certain things. 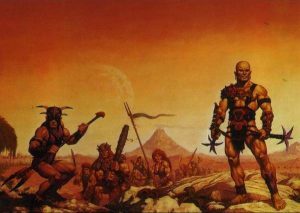 They are the setting itself being hostile to the players, which really is one of the big selling points of Dark Sun as a setting. And going on more specific adventures with a defined goal can always be treated as a means to accomplishing the default goal of staying alive. Helping others is not something you do out of kindness, but because they will give you resources and assistance in return, which then can help you to survive the deserts and stay ahead of the templars for a little longer. 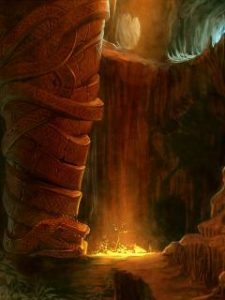 And in the long term, the players can make allies and gain the friendship of slave tribes or bands of elves, or can call in a debt from thri-kreen. Or even somehow get the gratitude of a clan of halflings. Lunatic canibal halflings who live in the one forest in a desert world that everybody else stays way clear of. 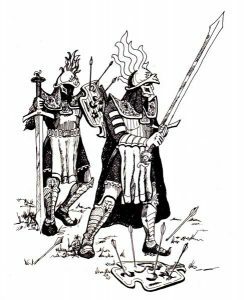 As they grow in personal power and gain allies, players can eventually get into a position where they can mean actual trouble for any of the sorcerer-kings. Whichever one of them the players decide to hate the most. The Tyr Region is perfect for a sandbox, and not just because it’s full of sand. However, given that the setting was created for AD&D 2nd edition and that the really cool concept was quickly turned into garbage by a heavy handed metaplot that had NPCs do all the things that would have been cool for players to do, I very much doubt that this was the intention. But that’s clearly how I would run it. The last weekend I have been watching a couple of videos on Youtube by Noah Gervais, in which he takes a closer look at the design of several classic video games and goes into a lot of detail. The games he covers happen to be many of my personal favorites and so much of my apreciation of the videos probably comes from him having very similar tastes to mine. And he’s talking a lot about things that essentially go into the subjects of worldbuilding and the methods of turning themes into actual gameplay and narrative. One observation that particularly stuck with me is how the visual design of Bioshock is not just drawing on designs and aesthetics from the 50s and 60s but overdraws them to the point of carricature. And it works perfectly. This got me to think about some campaign settings for RPGs that I’ve very long appriacted for being extremely rich in atmosphere and with a very distinctive art design, specifcally Planescape and Dark Sun. These two settings benefit greatly from having most of their art, and in the case of Planescape all of its art, done by a single artist. 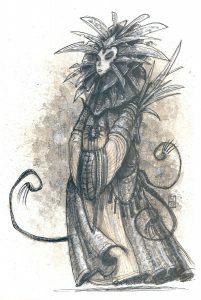 You may not know who actually wrote the Planescape campaign setting (though I recently learned that it’s by Zeb Cook, who did lots of other magnificent things), but if you’re familiar with the books, you know Toni Di’Terlizzi. The writing is great, but his artwork and overall visual design is really what makes the setting. Planescape wouldn’t be what it is without him. That is nice and good when it comes to making movies, videogames, or big budget roleplaying games that can afford to commission hundreds of pictures, but it’s not much use to hobby creators, novel writers, or simply people who run their own campaigns at home. I brought the subject up in a short but highly productive discussion on the Giant in the Playground forum and I think it really brought some very significant things to light. Drawings and paintings are nice and good, but it’s not just the art that makes amazing settings with a strong sense of wonder and mystery. At best, the art supports a setting that already has very solid writing. What really makes a setting stand apart and develop a strong individual identity and aesthetic are strong themes. 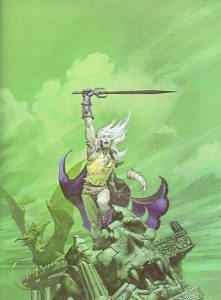 Ravenloft and Spelljammer don’t have any remarkable visual art in their books, but they still get mentioned among the most memorable RPG settings all the time. 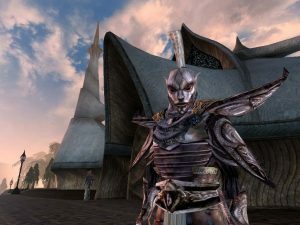 More generic settings like Greyhawk, Forgotten Realms, Golarion, and Tamriel of The Elder Scrolls are not generic because they use well know elements like dwarves, elves, orcs, dragons, and unicorns. I think it was Goethe who said that great writing is not about coming up with a truly original plot, but to tell the story in a way that it never has before. And these generic settings don’t really have anything new to say. The Dragon Age series uses the same old generic elements, but it still stands apart because it presents those elements in a new way. And the key to making the presentation of a world very strong is the heavy use of themes at all levels and in all facets. What do I mean by themes? I don’t simply mean that Dark Sun has a desert theme or Legend of the Five Rings an asian theme. Good (narrative) art always has something to say. It needs a central idea, a consistent mood, or even an actual message that ties all the elements of the world together. But themes are often very abstract things. Topics like “courage”, “compassion”, “self-destruction”, or “delusion” all sound very interesting, but how do you create a city that is about courage, monsters that represent self-destruction, or a power group of important people whose theme is delusion? And how do you create stories that are dealing with these themes without being too much in your face and preachy? That has always eluded me. But in the early 90s, TSR, a company with a very shaky history regarding product quality, was able to produce a good numbers of outright amazing settings year after year for quite a while. I don’t believe it’s coincidence or an amazingly gifted person who was in charge of hiring the best people they could possibly get. And at that time, they didn’t really have a lot of existing works to use as references. No, I believe there’s actually a method behind it which everyone can use once you understand the basics behind it. 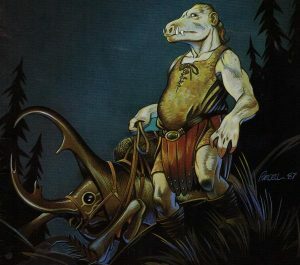 When talking about Sword & Sorcery and the essential traits and themes of the genre, there is almost always at least someone making the claim that the absence of nonhuman character is outright essential and that a work can not be Sword & Sorcery if it has any nonhumans that are not monsters. Yesterday someone made the commendable effort to provide a reason and supporting evidence why nonhumans are not a thing in the genre, by stating that there are pretty much no works of Sword & Sorcery which have nonhumans as counter evidence. Now obviously that gets us to a True Scottsmen argument. If your definition of Sword & Sorcery includes “no nonhumans”, then of course there are no works that have them. You could also say that Sword & Sorcery doesn’t have guns. But Salomon Kane has guns and I haven’t seen anyone claiming that he isn’t Sword & Sorcery. Guns are just uncommon, but not conflicting with essential traits of the genre. However, I want to argue that there are in fact many works that have all the relevant traits of Sword & Sorcery and also nonhumans, and in which the inclusion of nonhumans doesn’t in any way conflict with with those essential elements and themes. The first three Drizzt novels. I admit, most of these are fairly recent. But just because something is not found in the oldest works doesn’t automatically make it incompatible with a genre. It still walks like a duck, swims like a duck, and quacks as a duck.